“The Infinite cannot be measured. . . The plan of Nature is so immense, . But she has no plan, no scheme, . But to go on and on forever. . What is size, what is time, distance, to the Infinite? . Nothing. . The Infinite knows no time, no space, no great, no small, no beginning, no end.” . . -John Burroughs . . You are so much more than your plans . . You cannot and could never be limited . . The illusion was your belief that you could know what was to come . . That you could know in advance your own limitlessness . . That you could see beyond the horizon of your own creation that has no end . . Yes, you must move forward . . Yes, you must look ahead towards your never ending horizon . . To live is to endeavor to see what is to come . . But to also know deeply that you can only see where your path begins . . The reflection in the mirror of your own thoughts is not who you are . . It is who you WERE . . You are not the mirror . . You are the light that shines upon it . . A light of infinite beauty and immeasurable capacities . . Love makes no plans . . Love is content to simply love . . Love your life . . Not for what you are to become . . But for who you already are . . 🔥❤️🔥 . . GUIDANCE: it is easy to be wrapped up in our thoughts about ourselves positive or negative. Whether we are planning our future or reliving errors of our past. Release yourself from your own bindings. They could never hold you back anyway. . . Don’t just dream big, dream beyond all of your self imposed limitations. .
“The decision to kiss for the first time is the most crucial in any love story. . . It changes the relationship of two people much more strongly than even the final surrender; . . Because this kiss already has within it that surrender.” . -Emil Ludwig . . Trust . . Surrender . . Everything is working out for you . . You have nothing to fear . . You are supported . You are growing immensely rocketing to new levels of awareness, new levels of consciousness, new levels of love . . Trust the process . . You are transforming . . Trust love . . Surrender to the flow . . Ride the waves of change crashing through all of your constructed barriers . . Now is the time . . Allow your own expansion . . Embrace the love within your own heart . Feel true love’s kiss . . Trust in your own surrender to love . And be loved . . Here, now, and forever . . 🔥❤️🔥 . . GUIDANCE: Now is the time to trust. Sometimes the best way to ensure the best outcome isn’t to control it, or plan it. Sometimes the best way is to trust and surrender. Allow what you desire to naturally unfold. . . Riding the waves you work with the waves, float with the waves, forward focus, but always working with the current and tidal forces to co-create your desired outcome. You are supported. You are loved. Surrender to the flow of change. Love is here. “You may have a fresh start any moment you choose, . For this thing that we call 'failure' is not the falling down, . But the staying down.” . . -Mary Pickford . . Time for a fresh start . . To begin again . . You have never been satisfied by ‘staying down’ . . You have not failed . You are not a ‘failure’ . And you absolutely will not fail . . You are just beginning to learn to stand up for who you really are and what you really want . . You are not the same person who fell down, crashing so hard and deep into the earth that even you thought you were buried . . You now have more love than you have ever allowed yourself to experience before . . You are now married to your future . . You are your best self . . You have found it deep within you . . You were never buried . . You were planted . . You know who you are and what you are willing to take a stand for . . Your roots had to spread out AND down to support the unimaginable growth you have undertaken . . You are rising . . Draw from all of your resources and energy within you . . And GROW . . This is your new beginning . . You are no longer just a seed full of unrealized potential . . You ARE the new start you have been wishing to begin . . And you’ve always been reaching towards the sun . . . 🔥❤️🔥 . . GUIDANCE: Sometimes the best way to know what you are capable of is to be willing to ‘fail’ diving head first into your own seemingly impossible future... . . Only to discover, through encountering your own resistance, the resources that you already possessed within you to achieve what you yourself felt was beyond your wildest dreams!!! . Give yourself more love, more support for your growth, be willing to risk, allow yourself to trust in your own impossible dreams then you will know true success from the seed of seeming “failure”. You are so loved you have no idea. “As we express our gratitude, . . We must never forget that the highest appreciation is not to utter words, . But to live by them.” . -John F. Kennedy . . You are simply amazing . . I am so incredibly grateful for all that you are . . All your strengths . . All your supposed weaknesses . . All that you desire to be . . And all that you are becoming... . ...That you do not dare to dream is TRUE . . Yes, be good to people . . Be good to YOU . . YOU are deserving of your own love, appreciation, and gratitude . . LIVE by your own kind words and tender hearted good intentions . . GIVE yourself the true GIFT of your own loving attention . . Live . . Live . . LIVE YOUR LIFE . . You are truly yours FOR KEEPS . . You decide how much love you receive by how much love you are willing to GIVE YOURSELF . . Were you waiting for a SIGN? . . THIS IS IT!!! . . 🔥❤️🔥 . . GUIDANCE: True service, love and gratitude begins with what you are willing to choose to give and show yourself. . . The true sign of a loving person is that they allow for love to flow in ALL directions: . Consistently open to love all, consistently open to receive love from all, and absolutely know and trust that to feel love one must allow love to both COME AND GO FREELY. . Love is an energy you can align with and allow to flow through you and to you and others. Love cannot be contained. True gratitude is being in this alignment where everything you do in every moment is a natural expression of your loving appreciation. I love you. “Death is not the biggest fear we have; . Our biggest fear is taking the risk to be alive - . The risk to be alive and express what we really are.” . . -Don Miguel Ruiz . . You stand at the edge . . Before you, your limitless possibilities . . Your immense joy . Your true fulfillment . . . Behind you, your past experiences . . Your lessons learned . Your disillusionment . . . Now, you stand in your truth . . Now, you are ready to forgive yourself and others . . Now, you know, not just the next step you want to take; . . . But that you MUST take . . You realize, this path requires everything you have never been before . . YOU . . ALL of you . . Fear arises within you . . But go you must . . The ground beneath you no longer supports all of whom you have become . . You close your eyes . . Your body begins to lean forward . . You hold your breath . . . And fall . . You feel yourself completely lose your footing . . As you’ve held no part of you back . . You trust . . And you fall . . Past the point of no return . . And you fall . . And fall . . And fall . . Feeling only the air around you . . Wondering if you will ever find yourself on solid ground again . . And then . . . Just as unexpectedly . . You feel utterly loved . . Someone is with you . . And you, you fell into their arms . . And together, you find your footing again . . Yes, it’s you . . You have been waiting a long time; so patient, so kind, so loving . . And whose better hands to be in... . . Than your own . . . 🔥❤️🔥 . . GUIDANCE: Yes, you will live your full potential and live a life beyond your dreams. And experience true love. The only trick is everything you want to become requires the ultimate trust fall...trusting the person you will become and not the person you are... . . And it is the person you will become AFTER you decide to trust in yourself despite the fact you only know the person you have been in the past. . You MUST release everything you have been to become the person you CAN BE . . Trust you will catch yourself when you fall. . . As it’s been said before, sometimes the only way to know you can trust someone is to TRUST them. I was walking in downtown Santa Cruz and was surprised to discover this small metal heart on a larger metal structure on the side of a building. Certainly I had missed seeing this heart dozens of times. It is in plain sight, but, even now that you know that it is out there in downtown Santa Cruz it may prove challenging to find it, though I happened to glance upon it and it caught my eye. Thought this might prove to be a suitable photo for what inspired me today to talk about which is the idea that “Love is blind”. The love object, in this case, you might be blind to, but this metal heart, a representative of love, absolutely is not hidden from sight. In the last post I talked about the need to intentionally connect to love, if you want to find love, since love is ever present. In this sense ‘love’ can be considered ‘blind’ since we can be ‘blind’ to the fact that we already have the love we seek. Love within is clearly not hidden from sight but we do have to connect to it. “Love is blind” usually refers to being blind to particular attributes of the person we are in love with, especially when it comes to negative attributes. We focus on all of the positive aspects of them and reduce the significance of, or ignore altogether, anything that does not ‘fit’ with our infatuated loving vision of our beloved. And I feel there is some truth to this, especially in the early stages of a love relationship, where the passion is enmeshed with the love for the other person. But this type of love blindness is not true love. I’m not saying that love is not present, but that infatuation is what is causing this blindness to a person’s shortcomings or incompatibilities, not love. So this is not the love blindness of higher love. Higher love does have a blindness and it’s not just the possibility of being blind to the higher love within. If you reside in a state of loving consciousness towards yourself and others, you intentionally choose to focus on the positive attributes and potentials of all souls, yours included. But it is more than this. You are aware of their higher self, whether it is fully expressed in the person or not, and connect to the higher love that exists in all of us. And, you can connect to this higher love, while still acknowledging and being fully aware of, where that higher love is not yet being allowed to express itself in that individual. So where is the love blindness in higher love? In this loving state towards self and others we can disconnect and blind ourselves from the grounded reality of being human. Sometimes we find that we are better at loving others from a place of higher love in the world than ourselves. Absolutely love others from a place of higher love, but this does not mean that you do not need healthy boundaries with others here in the real world. For instance, you may want to stay with someone whom you know loves you and you love them. But, if their actions do not reflect that love, you need to respect and love yourself and them, by ensuring that the love is being acted upon with equal give and take and remove yourself from that relationship if that is what is necessary. Yes, there can be sacrifice in love but with the other person making similar sacrifices and never at the expense of loving yourself. You are equally worthy of that love. Someone who truly loves you does not ask you to be a martyr. So please always love yourself. If you are awesome at loving others from that higher love place, don’t be blind to giving yourself that same higher love. You are loved. You are worth it. You are not hidden from sight. Want love? Connect to your love. Above is an excerpt from “The Destitute Child”, a mindful poem by Thich Nhat Hanh. Thich Nhat Hanh is truly speaking from his heart and you can feel the love and compassion in his words. Honestly, to me it seems all of his writings, spoken words, and deeds are expressions of his heart. We all want love but, even more precisely, what we want is to feel love, experience it in our hearts, our souls, our being. We often come to love with a lack mentality that love is something to seek out and find. For instance, we think we need to be in a loving relationship with someone who says that they love us and if we are not in that kind of relationship we don’t have love. And perhaps, what can be even more challenging, are the times when we do find ourselves in a relationship, where the person we are with says they love us, but we still do not feel loved. You want love. How do you get it? The truth is you never lost love. You don’t have to find it. You don’t have to protect it. You already have love. If you do not feel loved, you need to reconnect to the love that resides within you. There are many ways to feel love again. One way is to feel the love you have for those in your life you love or have loved the most deeply. Connect to that feeling and magnify it by reimagining experiences with them where you felt that love with them. You can take this further by writing down these experiences of love and reconnecting to that love. Another way to connect to love is to express love, share your love, speak love. Maybe there is someone in your life right now whom you love but you have not shared this with them. Be brave and express your love and share it with them. Even if you just write down how you feel this act can help you reconnect to love. Or perhaps you are already in a loving relationship that does not feel as loving as it once was. Reconnect with those times where you felt the most love in the relationship and talk with them, sharing with them those loving memories. There may be no one in particular you are feeling love towards right now. If so, you can simply connect to the present moment as Thich Nhat Hanh suggests in the poem. You can also connect with all of what makes you feel loved that others have done for you and do an act of service for someone else, giving to someone else one of those same loving acts. Experiencing how your loving act affects another is one of the strongest ways to connect to and to feel love. Regardless of how you connect to your love, what you may understand now is the true reciprocity of love. Any love we feel, express, or give to someone else is also directed towards our own hearts. So, if you want love, find the love in your own heart and share it. Precious gems are everywhere in the cosmos and inside of every one of us. I want to offer a handful to you, my dear friend. Yes, this morning, I want to offer a handful to you, a handful of diamonds that glow from morning to evening. Each minute of our daily life is a diamond that contains sky and earth, sunshine and river. We only need to breathe gently for the miracle to be revealed: Birds singing, flowers blooming. Here is the blue sky, here is the white cloud floating, your lovely look, your beautiful smile. All these are contained in one jewel. You who are the richest person on Earth and behave like a destitute son, please come back to your heritage. Let us offer each other happiness and learn to dwell in the present moment. Let us cherish life in our two arms and let go of our forgetfulness and despair. Posted on February 16, 2018 Leave a comment on Want love? Connect to your love. We are all on a journey of self-discovery that feels at times, like this sketch, where a lone traveler walks an unknown climbing terrain seemingly to nowhere. However, it is in our relationships with others where we are driven to look within, to become our best self, and to reveal our own truth. The source of our desire is love. In loving service to others we can discover ourselves as we do not really “lose” ourself in service, we find it, as it is reflected in those we serve. This is where my instagram post ended but I want to expand on ideas mentioned in this post further. Here I am starting with the general notion of ‘finding yourself’ and in later posts I’ll discuss more about love and service. The idea of ‘finding yourself’ as we traditionally conceive of it, such as the lone traveler who ‘finds themselves’ on their journey through mere self-reflection, is a bit misleading. Yes, inner reflection and contemplation is absolutely a part of the process. But it is not the only part of what is necessary for true self-discovery. You are, in large part, a reflection of and co-creation with everyone who has been a part of your life. You cannot truly sever who you are from these relationships be they great or small. Think of your family of origin, for instance. Some of your first self-concepts were generated from your relationships with the people who raised you. In your family you were taught their idea of what it means to be a person either explicitly, by telling you directly, or simply via their example and interactions with you. Let’s say that when you were growing up you saw your mother and father work all day at jobs they did not love. You internalize, at least to some extent, that working is an important part of what it means to be a functional person in the world and that enjoying your job is not as important. Your parents may have even directly told you that “You need to work to make a living and contribute to society”. Self-reflection is the means by which you can not only discover your internalized values and beliefs but also decide whether they are values and beliefs you want to truly embrace. Let’s go back to our example. Through self-reflection, you can come to an understanding that the ‘Working is important but enjoying your work is not important’ concept was modeled to you by your family. Then, once you have brought this into your awareness, you can intentionally decide whether you want to reject or accept this family modeling that was given to you. Maybe you feel that working is still important to you but you also feel that it is important to love the work that you do. However, you’ve noticed you feel guilty every time you try to leave your current job that you don’t enjoy to pursue work you love. This can be due to a conflict between what you were raised to believe versus what you have come to believe in time through other personal experiences. The solution? First, you need to discover that you have this conflict of values and beliefs and then you need to consciously choose the belief that is in alignment with what you truly value. In our example, you would need to realize that you do not identify with what you were raised to believe: ‘Working is important but enjoying your work is not important’ . Then you need to embrace and consciously choose the belief and act from the belief that is in alignment with your values: ‘Working is important but enjoying your work is also important’. In some ways it really is this simple but old beliefs and values can be resilient since through time they become habitual and internalized. Changing your beliefs to be more in alignment with your values is a process. The more ingrained the belief, the more patient and compassionate you need to be with yourself to support yourself to forge a new path and way of being. Finding yourself is a process of coming to understand yourself, what you value and believe. But it is also a process of understanding all of the people and relationships in your life and how they have all been a part of who you have been, who you think you are, and who you are becoming. Finding you is finding others. Becoming a better person in this way is finding the best part of you and others that you have internalized within yourself and choosing from all the beliefs and values you have been given what you truly want to be and become. I hope you are happy now! TRULY!!! It’s unfortunate that when we usually hear the phrase “I hope you are happy now!” it typically comes with sarcasm and perhaps a tone of bitterness and anger even though sometimes in jest. Usually someone says this after some ‘bad’ consequence comes as a direct or indirect result of someone making a choice you don’t agree with. A sort of “I told you so” when you felt you knew it was not going to work out well if your friend, for instance, decided to still have another drink more than you thought was wise and they are now throwing up in your bathroom toilet. “I hope you are happy now!” you say, while holding their hair and shaking your head. The time has come to truly wish others are happy NOW! INCLUDING and even ESPECIALLY when other people are making choices you do NOT agree with. I should be clear right from the onset here that I do not mean that you should let others do things to you, support their actions, or do things with them that you do not agree with personally. Truly wishing others are happy means supporting the PERSON even if you do not support their personal CHOICES. At the same time, you still must support YOURSELF and honor your own values, your truth and decisions regardless of whether or not your choices line up with someone else’s be they friend, family or stranger. However, it seems we often want to make other people’s choices about us when really it’s all about them and their path and not about you. Even if they are making a choice that directly affects you, if it is their choice it is THEIR choice, not yours. We need to honor and respect each other unconditionally. And more than this we need to be truly HAPPY for them and wish them well despite this disagreement/difference. Stand your ground, of course, but let them stand theirs as well. Now this is not just for a one off decision you do not agree with, this should also be for larger life changing events or even for contrasting worldview perspective(s). And this is absolutely more than agreeing to disagree. It is true love for every person whether or not they see things and choose things in alignment with you. We each need the freedom to choose what WE think is best for us including the freedom to make ‘poor’ choices. It is worth mentioning though that you could be the one making the ‘poor’ choice and not them, just saying 😉 . The only way to truly know and learn is through experience. Admittedly, having watched those I love make choices that break my heart, this is not necessarily the path for the weak of heart. Loving someone and standing in your truth does sometimes mean saying goodbye. I had this happen with a friend I truly love and care about deeply a few weeks ago and is honestly the inspiration for this post. I really wanted them to make a different choice and felt I knew what was best for them and for our relationship. But they are the only ones who can really discern what is good for them. As I came to peace with their decision I realized that at the end of the day I truly just want them to be happy. And if this choice is what makes them happy, whether I agree with them or not, I am happy for them. One way to think about it is that it is like a walk on a trail. You go on this walk and you make a new friend along the path. “You want to walk beside me on this path? Great!” and you walk side by side together. The path splits…one route is part of the main trail and the other a small rugged side trail with brush and several obstacles on it. “You want to go on the main trail? Great! I want to try that gnarly side trail adventure. Have fun on the main trail!” You each go your different ways. Maybe your paths come back together. Maybe they don’t. You can’t tell from where you are standing. But you both can enjoy walking your path and be happy both when you and your new friend are together, choosing to walk the same path, or, still happy when you each choose to go in different directions. We need to find our way to be happy on the trail, the path we choose, and allow others to choose their own path. What works for them may or may not work for you. You are two different people with different histories, presents, and futures. Being attached to what you want for others or what you understand or believe is right for others may delay you both on the path you each need to travel to come to a better understanding of yourself and your authentic journey. For you and others in your life, if you really want to know if the path you are traveling is right for you, you must walk it! We all want the same freedom whether it is the best choice for us or not. Sure, you should still tell people if you know about an impossibly steep hill or dangerous cliff up ahead, but, if they still want to try and climb that hill or walk the narrow path beside the cliff…let them!! AND truly be happy for them even if you are right and they end up getting hurt in the process as it was their choice! I’m not saying you have to like it but you do need to respect the fact they are the ones responsible for their own choices and it is their path and not yours! So to the extent that the person you care about is happy with their choice, even if you don’t like it, you can find solace in their contentment with their decision. So to each and every one of you, embrace and respect your own values and truth, walk your path, choose your own adventure, and I hope you are happy now! TRULY!!! Posted on January 26, 2018 January 26, 2018 Leave a comment on I hope you are happy now! TRULY!!! Time for a confession…this is not the first time I’ve started a blog. I think this is my fourth blog reinvention! Each blog had a different focus and none of them ever really got off the ground. I wasn’t motivated to work on them and I think I understand why. None of them fully resonated with my authentic self and purpose. Setting your intention before beginning something new, a blog or otherwise, I feel is essential. But intention is not enough and good intentions of course are not enough either. It may or may not pave the road to ‘hell’ but the aims of our good intentions need more than simply our intent towards them. Each of my previous blogs had good intentions but something else was missing. Blog #1 was on the process of getting Phd and sharing my experiences in hopes it may help others going through the same process. I think I made a total of two entries. The first when I was just about to start taking my classes and then the second when I was done with the program. Ha! Perhaps this was a true reflection of what it was like as I didn’t have a lot of time to focus on work outside of my program. Blog #2 was an attempt to share ethics and moral thinking. This time I had like three entries. While I still like what I wrote, it reflected I think more of my lecturer side discussing topics more like I would in an introduction to ethics course. Blog #3 was really the seed blog parent to this blog. I was just starting to get grounded in a real sense of my authentic self and wanted to really reach out publicly and open up in an honest and vulnerable way. It really felt like a stretch then. I posted just one entry and I’ve included it below. I think I just wasn’t ready yet. Though it was really eye opening to me now to go back and re-read what I wrote two years ago as a simple, single, one blog entry offering of my new year’s resolution to be ‘unconditional’. This brings up to date to this “Live You” Blog, or in this context Blog #4! So what is this blog all about anyway? Being my authentic self and helping you to be your authentic self. Another good intention? Yes. But good intentions are clearly not enough if you are not personally in alignment with your intentions. Meaning your intentions must line up with your WHY, your purpose, your values, what truly resonates with your heart and soul. This alignment with your purpose and what gives your life meaning is not visible on the outside or on the virtual words on a digital page. It is felt. How do I know this blog reinvention is different? I can feel it. Joseph Campbell, the famous American mythologist, is well known for instructing his students to “Follow your bliss”. I am following my bliss. So follow not just your good intentions but also your bliss and you will find not just success my friends but happiness and well-being. See you on the blissful path! It’s the first day of the new year and resolutions abound. I resolve to be ‘Unconditional’. What does this mean? To not place conditions upon myself or others. It is another way to embody unconditional love but emphasizing what ‘Unconditional’ expresses. ‘Unconditional love’ comes with social and cultural baggage and I can imagine some are already rolling their eyes with just the mention of the phrase. We are quick to dismiss and think, because we understand the words, that we understand the deeper truth of the phrase. If you are ‘Unconditional’, you recognize others are deserving of respect and are worthy regardless of the conditions of their actions and choices. Worth is independent of conditions even if you would prefer others were different. If you are ‘Unconditional’, you recognize you are worthy regardless of the conditions of your past, present, or future. If you are ‘Unconditional’, you recognize the conditions of your life do not determine your inner thoughts, beliefs and feelings. In other words, if you want to change your reflection in the mirror, change yourself not the mirror. If you are ‘Unconditional’, you recognize you can be your best self now. So in this ‘Unconditional world’ blog I work to create an ‘Unconditional’ self and work for an ‘Unconditional world’. …one final note. I think I needed to have each of these previous blogs to get to where I am now. In this way those blogs didn’t ‘fail’ but were just another part of the journey. Sometimes you need to understand what doesn’t work before you can truly understand what does work. What is the only answer to all of our problems? Martin Luther King’s response shouldn’t surprise you. Last Monday was Dr. Martin Luther King, Jr. day and I both observed and participated in a local march in downtown Santa Cruz, California. Demonstrators were diverse in age, gender, color, and nationality; as Dr. Martin Luther King, Jr. would have wanted. Participants walked bearing a range of signs representative of their purpose and intentions for their presence from large banners of organizations to simple hand written Martin Luther King quotes on cardboard. One of these simple signs truly caught my eye and it bore the quote: “I have decided to stick to love…Hate is too great a burden to bear. -MLK”. It wasn’t a quote I was familiar with, so when I had the chance I decided to look up the quote to learn about the source and circumstances. Turns out it was from a speech Dr. Martin Luther King, Jr. gave titled “Where Do We Go From Here?” delivered August 16th, 1967 at the 11th Annual Southern Christian Leadership Convention in Atlanta, Georgia. The speech’s title echoed the messages and title of his recent book released almost two months earlier in June of 1967: “Where Do We Go From Here? Chaos or Community?”. – Dr. Martin Luther King, Jr. says in this same “Where Do We Go From Here?” speech. I have also decided to stick with love, for I know that love is ultimately the only answer to mankind’s problems. And I’m going to talk about it everywhere I go. I know it isn’t popular to talk about it in some circles today. And I’m not talking about emotional bosh when I talk about love; I’m talking about a strong, demanding love. For I have seen too much hate. I’ve seen too much hate on the faces of sheriffs in the South. I’ve seen hate on the faces of too many Klansmen and too many White Citizens Councilors in the South to want to hate, myself, because every time I see it, I know that it does something to their faces and their personalities, and I say to myself that hate is too great a burden to bear. I have decided to love. If you are seeking the highest good, I think you can find it through love. Thank you Dr. Martin Luther King, Jr. And thank you to the family who carried their homemade sign reminding us all of the authentic value Dr. King stood for and that we absolutely need to remember right now in our times just as much as his. Posted on January 20, 2018 January 20, 2018 Leave a comment on What is the only answer to all of our problems? Martin Luther King’s response shouldn’t surprise you. From the Archive 09/09/2017: YES!!! You absolutely are AWESOME!!! You really need to KNOW this!!! This is about truly knowing YOUR self worth! You ARE worthy, you are AMAZING, you have SO much to contribute by yes, you guessed it, by just being YOU! This is not just a positive affirmation or fluffy pollyanna thinking. EVERY person, every BEING is valuable beyond measure. One of the major considerations in ethics is about who and what has moral worth, has value, is deserving. And knowing your worth, your VALUE is an essential starting point for authentically living your values. At the end of the day you want to live well because you are indeed worth the investment of your time! Now this does not mean that placing value on yourself requires seeing others as less valuable or worthy. In other words, valuing yourself does NOT mean you are selfish! It means recognizing your value AND the value of others. And if you truly care about others, you must first know your value, your absolute AWESOMENESS and care for you. Your love for others and capacity to love is a reflection of how you view yourself. So yes, absolutely BE A GIVER but you must be compassionate to both yourself and others. Just like the stewards and stewardesses remind you that should oxygen masks be deployed place your mask on first and then help others with their masks (or you might pass out before you can!!!). YOU ARE AWESOME!!! 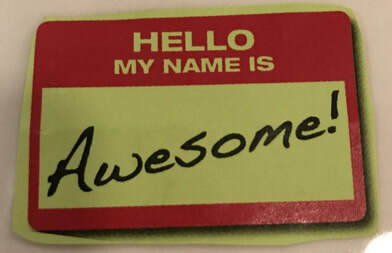 Go ahead, grab a name tag, write it and wear it proudly!!! Posted on January 17, 2018 January 20, 2018 Leave a comment on YOU ARE AWESOME!! !